If you listen to enough elk hunting stories, a pattern will begin to emerge. 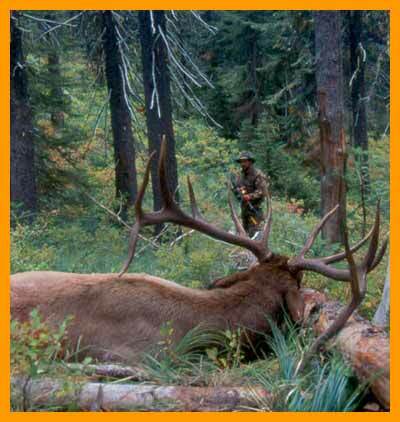 You’ll discover that the difference between the elk hunters, and the elk killers, is often really quite simple. One tells stories of close calls and missed opportunities. The other talks about how he made the shot and ate elk heart for supper. The two kinds of elk hunters have much in common. They both do their research, condition their body, practice long hours and hunt hard. And, at some point in their hunt, they both had at least one opportunity to kill an elk. We don’t always get an opportunity, but if you listen closely to most stories, there is usually one chance in there somewhere. The hunter who makes the most of that opportunity is promoted to the ranks of the elk killers. The others keep hunting. right moves, at the right time. 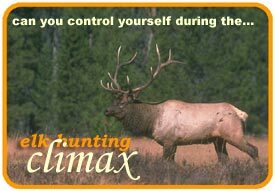 The elk hunting climax. Since hunting from a treestand, or at a waterhole is a different ball game, we’ll only concentrate on that moment when a bull is responding to calling and things are about to happen. But first, the set-up. The hasty set-up, or in some cases, no set-up, is one of the biggest mistakes bowhunters make. They will stand around in the open and lackadaisically bugle or cow call, then get burned when a bull suddenly responds. A decade ago, we learned the hard way. After days of fruitless calling, a raghorn bull came casually walking into to my bugling and caught my partner and me sitting on a deadfall with no arrows in our bows and mouths hanging open. Our one chance was blown because of carelessness. It takes discipline, especially after days of no action, but you should be under cover, nocked and ready each time you call. A bull can be on top of you, and gone, before you finish cussing. Choosing a set-up is probably the most important decision you’ll make. I prefer to set up in the timber, but in an area where it’s a bit more open than the surroundings, a place where the trees and brush thin out a bit. I avoid calling from the edge of a meadow or slide, or any place where a bull would have to walk into the open to get to me. 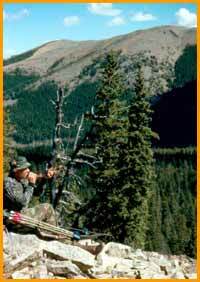 Whether I’m calling blind, or have a bull on the way, I never set up where there is a ridge or hill within bow range. Do that, and you are essentially providing a bull a perfect place to hang up. As soon as his head crests the ridge he’ll stop and scan for the elk you represent with your calling, but only his head and neck may be visible. He may stand there for an eternity, just waiting for something to move. Trouble is, if something moves he’s gone, and if something doesn’t, he may still become suspicious and leave you wishing you hadn’t set up next to that ridge. Stick to gradually sloping terrain so the bull is completely exposed. When you have a bull coming, you can sometimes set up where there is a natural funnel to direct the bull’s travel route. A steep wall, a saddle, thick brush or a well-used trail can help you put the bull where you want him. You can even use a large meadow behind you as a block by counting on the bull to avoid the open and come down the trail you’re watching. It doesn’t always work, nothing does, but it could. Some bowhunters set up too well. They tuck into some thick brush or in a small island of cover, and can only watch as a suspicious bull circles to get downwind. Take care not to hide so well you can’t adjust your position, if necessary, to make the shot (more on that later). Set up in front of cover instead of behind it. Make sure you have ample shooting lanes and clear away any forest floor litter such as pine cones, dry needles and twigs, so you can shift quietly.You can either stand or kneel, whichever hides your form the best, but I prefer to kneel. Take the time to set up, every time you call, and it will pay off. We usually hunt as a team, a caller and a shooter. Over the years we’ve developed a signal system to prevent ending a set-up prematurely, like when one of us is unaware a bull is present, or coming. Here’s how it works for us. The caller will go through his calling sequence, usually starting off with cow calls. If there is no response then he will try bugling like a raghorn for the first couple calls, then maybe graduating to a more aggressive scream. Regardless of the sequence at the time, a single cow squeal means, “I’m done and I think we should move.” When cow calling we always use a series of two, three or more squeals so when a single squeal is heard, we notice it (most of the time, anyway). If the shooter sees nothing, hears nothing and agrees it is time to move, he responds with a single cow squeal and we slowly stand up, with an arrow on the string, scan carefully, then get together to plan our next move. If the shooter does have reason to stay put, like hearing a branch break, or a bull is standing twenty yards away, shielded by brush, he does not answer the caller’s single squeal. When the caller does not get an answer, he becomes especially alert and continues calling as he was previously. By not forcing the shooter to respond, he does not give away his position to the elk. No matter how long you call, you risk spooking a bull when you get up from a set-up, but this system helps prevent one hunter ruining an opportunity for the other. Then there’s the decoy option. The idea is to give the bull what he’s looking for, an elk. A bull knows he should see an elk and when he doesn’t suspicion sets in. That’s bad and usually leads to a bull getting downwind of your set-up. Give him that elk by using a decoy. It doesn’t have to be anything spectacular and two-dimensional decoys like the Feather Flex or the Montana Decoy will work. All the bull has to see is a partial tan body and he will relax a bit. He truly wants to see an elk and if you give him one, there’s a chance he won’t hang up out of bowrange. Again, nothing works all the time but the key with a decoy is to use it as much as possible. I seldom set up without it, because as soon as I do, you know what will happen. When your elk encounter reaches “critical mass” and the shot is imminent, you will make several decisions that will determine success. When a bull or cow responds to a call, they are on alert status, no longer wandering around carefree. They listen and search for the elk that called to them, which is you. A bull may stand and watch for a long time, waiting for an elk to move or make a sound. If you oblige him with either stimuli, he’s gone. The decoy is the exception here. If you do know a bull is very near, close enough to see you, do not call. Remain quiet and make him look for you. If you do call, even a cow call, that bull can pinpoint the location of that call with uncanny accuracy. You will then be unable to move and the encounter will be over. Only call if the bull turns to leave, then hit him with a soft cow call. If he keeps going, keep calling or try bugling to rekindle his interest. If that doesn’t turn him, back off and save him for another day. Drawing your bow undetected is the most critical move you make. A smooth, easy draw is much less perceptible and you may need to do it from an awkward position, so shoot a bow you can draw easily. You’ll be on the ground and will have to pick your moment carefully. Drawing too soon, risks a stalled bull and having to let down. Waiting too long, risks a fast-walking bull getting through your shooting lane before you reach your anchor. It can be a gamble, but think ahead, forget those antlers, and plan your draw move when the bull is unable to pick you out. Now for a difference maker. Be bold if necessary. If a bull appears to be hooked and comes in without much hesitation, let it happen. If he veers off unexpectedly, or acts suspicious and begins to drift downwind, you may have to make it happen. As I mentioned, leave yourself an out in case you have to move ten or twenty yards to get a shot. Depending on terrain, you can often use cover and move quite a distance to adjust and improve your situation. If a bull is broadside within your personal bow range, and he picks you out, quickly and quietly draw your bow and shoot. Bull elk will often stand right there and give you the shot as long as they don’t hear anything, but you have to be quick about it. That hesitation has put many elk hearts on the supper table. Of course, there are exceptions to everything, and you haven’t read the words always or never here, but I’ve found being bold at the right times has made the difference for me. I’m not talking about forcing a shot, but rather “creating” a shot opportunity by making the right elk moves. Now, the shot placement. Mentally draw a horizontal line through the center of the bull. Deliver the arrow in line with the front leg or just behind the shoulder, but below that imaginary line. Shoot much above that line and you could end up with a difficult, and fruitless, tracking job. I prefer broadside over quartering away because I like two holes for bloodtrailing. 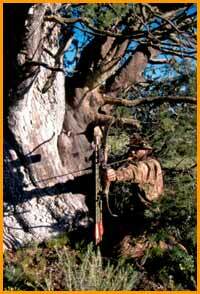 However, elk cannot take an ultra-sharp broadhead through both lungs and will go down quickly. I’ve had bulls hit the ground within five to ten seconds, and never move! That doesn’t leave much of a tracking job. Immediately after the shot, cow call or even bugle. It can stop a bull cold and cut down on your tracking job. Pay close attention to the bull’s line of travel and listen carefully. If you hear labored breathing or wheezing, you’ll be eating elk steaks for supper. But don’t hurry to the trail. Tracking a poorly hit elk is extremely difficult. If an elk gets up, he will cover so much distance, so quickly, you will be left with a faint bloodtrail, if any, and probably never see him again. Use your normal blood-trailing sense. Lately, I’ve been in a mini-slump when it comes to elk and real opportunities have been nonexistent. But I have a turkey and a black bear under my belt already this year and I feel my luck is changing. Next month we’ll be trying our elk moves on the bulls of British Columbia. If I get an opportunity, I’ll make it happen. Did I mention the part about the need for a little bit of cocky confidence?